A beer, made from bagels, to help fight food waste. - Modist Brewing Co.
A beer, made from bagels, to help fight food waste. Modist Brewing Company, Rise Bagel Co., and TC Food Justice are pleased to present a very special collaboration beer: No Bagel Wasted. 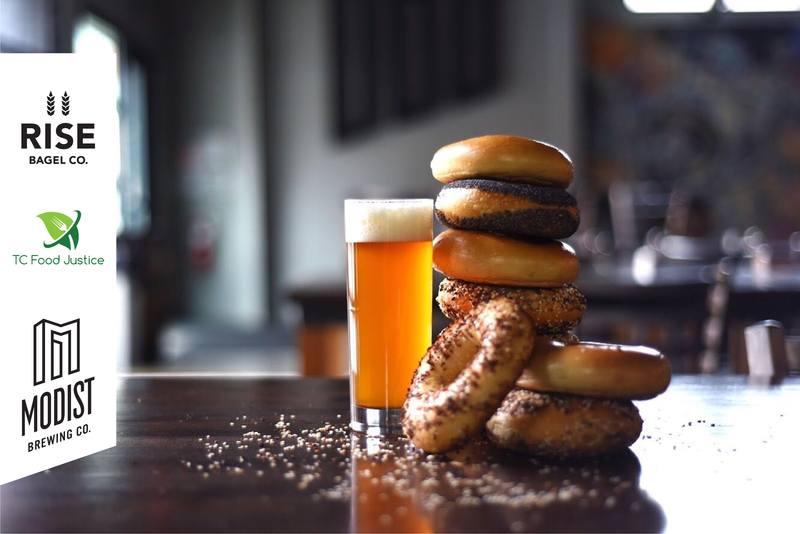 A beer, made from bagels, to help TC Food Justice‘s effort to reduce food waste and hunger! Instead of letting any excess bagels end up in a garbage graveyard, Rise and Modist began collecting the bagels in an effort to do what any responsible people would do: turn them into beer. Over the course of about a month, Rise and Modist were able to collect 150+ lbs of bagels that were then ground into a flour that formed the malt bill of No Bagel Wasted. The beer, brewed from Rise Bagels along with some White Clover honey, is a toasty, easy-drinking lager that will go on tap at Modist on January 26th. 10% of all proceeds from the beer will be donated to Twin Cities Food Justice – a 100% volunteer organization that works tirelessly to help reduce food waste and hunger. We’ll all be at Modist celebrating the release from 1-3 PM on Saturday. Come bye say hi. Photo by Haley Marie Photo.